Draft: 2005, San Diego Padres, 2nd rd. Nicholas John Hundley was originally signed by Padres scout Dave Lottsfeldt…graduated from Lake Washington High School (Redmond, WA) in 2002 and was named Oregon State Player of the Year…also played football until his senior year when he focused on baseball…was drafted by the Marlins in the fifth round but opted to attend the University of Arizona…his father, Tim, was a longtime college football coach and is in the NAIA Hall of Fame. three …saw his most action with 21 starts in the fourth spot and 18 batting fifth. (also Sept. 7, 2016-May 26, 2017 and April 21-June 25, 2014). Hit .244 (70-for-287) with 23 doubles, nine home runs and 35 in 101 games in his fi rst season with San Francisco...Was named the 2017 Willie Mac award winner...was the eighth player to win the "Willie Mac Award" in his fi rst year with the Giants...Appeared in 101 games (65 starts at catcher)...32 of his 70 hits this season were extra-bases (23 doubles and nine home runs)...Runners were 13-for-36 (26.5%) on stolen base attempts against him...Recorded the fifth game-ending hit of his career on July 22 vs. San Diego, hitting a game-winning single in the 12th inning to give the Giants a 5-4 win...Slugged his second career walk-off home run on Sept. 2 vs. St. Louis in 10th inning. Played in 83 games and recorded a career-high 48 RBI with Colorado. Hit 10 home runs for the second consecutive season, the first time in his career he has hit double-digit home runs in consecutive seasons. Hit his first career grand slam Sept. 2 vs. Arizona off RHP Silvino Bracho. Was placed on the disabled list twice, from April 16-25 with a concussion and May 6-June 3 with a strained left oblique. Signed a two-year contract with the Rockies Jan. 5, and batted a career-best .301 (110-for-366) in 103 games as Colorado's starting catcher. The .301 batting average ranked second among MLB catchers. Recorded 10 home runs, his second season of achieving double-digits in the category (13, 2013) … nine of the 10 home runs came off of right-handed pitching. Tied career highs in triples (five) and stolen bases (five). Went 4-for-4 with three runs scored June 21 vs. Milwaukee, tying his single-game career high in both hits and runs scored. Batted .341 (30-for-88) from April 20-May 26 to lead all Major League catchers during that span. Recorded a career-high, 13-game hitting streak from April 20-May 20 (.409, 18-for-44). Was placed on the 60-day disabled list Sept. 11 with a cervical strain, and did not play again in 2015. Acquired by Baltimore on May 24 from San Diego with Matt Wieters on the disabled list...Made first start for Baltimore on May 26 at Milwaukee and collected game-winning RBI single in the tenth inning, joining Nelson Cruz collecting game-winning RBI in first game with the club this season...Hit walk-off RBI single that scored Manny Machado in a 4-3, ten-inning win vs. New York-AL on July 11...Posted a season-high three RBI, hitting a three-run HR off Phil Hughes in the seventh inning, Sept. 1 vs. Minnesota...was his first game-tying HR since Sept. 29, 2013 at San Francisco...Tied a season-high with three RBI, hitting a three-run HR off Mike Leake in the first inning, Sept. 4, vs. Cincinnati...Was the eight time in his career hitting home runs in consecutive games (first since Aug. 13-17, 2013). Played in a career-high 114 games, setting career-highs in several offensive categories including hits (87), doubles (19), home runs (13), RBI (44) and runs scored (35)...Started a career-high 102 games behind the plate…tossed out 23.6 % (25-for-106) of attempted base stealers...Led the Padres with a career-high nine game-winning RBI…eight of his nine game-winning RBI came while playing catcher, joining Ramon Hernandez in 2005 (also eight) as the only Padres catchers since 1993 to recorded eight-or-more...Career-high 13 home runs were the most by a Padres catcher since Mike Piazza had 22 in 2006, the franchise record for homers in a season by a catcher...Began the season by hitting .329 (26-for-79) with eight doubles, three homers, 11 RBI and 12 runs over 21 games in April...On August 25 vs. Chicago-NL, came into the game as a sub in the eighth and went 2-for-5 with the game-ending RBI-single in the 15th as the Padres won 3-2…was the third walk-off hit of his career...On September 8 vs. Colorado, the day of his 30th birthday, came up with a game-winning, pinch-hit three-run double...Had a season-best seven-game hit streak April 23-May 2 (.379, 11-for-29), two shy of a career-best nine-game hit streak (twice)...Homered in back-to-back games twice: July 23-24 and August 13-17...Recorded a hit in six-straight at-bats over a stretch from April 10 (4-for-4) and April 11 (2-for-4), two shy of the club recorded…the four hits on April 10 vs. Los Angeles-NL tied his career-high (4x, previous: April 27, 2012 at San Francisco)...He and his wife, Amy, had their first child, a baby girl, on August 15...was on Paternity List from August 15-17. Played in just 58 games for San Diego, his least amount of games played in a season and lowest amount since his rookie campaign in 2008. Began the season with the Padres, hitting .166 (32-for-193) overhis first 53 games before being optioned to Triple-A Tucsonon 6/30.After beginning the season hitless in his first seven games from4/5-14, hit .395 (15-for-38) over his next 10 games immediatelyfollowing that stretch from 4/15-27.In 13 games for Tucson, he hit .190 (13-for-42), missing timedue to a stint on the seven-day DL with Tucson due to a strainedhamstring.Recalled from Tucson on 8/9 and went hitless in 11 at-bats beforebeing placed on the 15-Day DLwith a bruised right knee on 8/17,missing the remainder of the season...transferred to 60-Day DLon 8/27.Tripled, homered and knocked in a career-high four RBI on 4/22 vs. PHI.Career-high tying four hits 4/27 at SF (3x, last: 8/20/11 vs. FLA).Tossed out 19 of 73 attempted base stealers (26.0 %) this season.Hit the 11th triple of his career on 4/22...the third-most all-time by a Padres catcher behind Benito Santiago (15)and Gene Tenace (13).Started the season with an 0-for-21 streak...was the third-longest hitless streak ever to start a season by a Padresnon-pitcher, and longest since Ozzie Smith's club-record 0-for-32 stretch to begin the 1979 season...the hitlessstreak was tied for the longest of his career, also going 0-for-21 in 2009 (6/17-8/20/09).Agreed to terms on a contract through 2014 with a club option for 2015 on 3/20 prior to the start of the season. Set career highs in nearly every offensive category, including runs, hits, triples, home runs, batting average, on-base percentage and slugging percentage...Started a career-high-tying 73 games behind the plate (also 2010), marking his third consecutive season with 70-for-more starts at catcher...Hit at a .307 clip (42-for-137) at home while hitting .271 (39-for-144) on the road...average at home was the fourth-highest all-time at Petco Park (min. 100 PA)...Made two trips to the DL...first placed on the DL 5/6 with a strained right oblique and reinstated 6/8...placed on the DL again on 7/8 with a strained right elbow and was reinstated 8/12...underwent arthroscopic surgery on his right elbow on 7/8...Fell a triple shy of the cycle on two occassions during a nine-game span from 8/12-21, despite also hitting four triples during that stretch...five triples on the season tied Benito Santiago (1990) for most in one season by a Padres catcher...Named the NL's Co-Player of the Week for 8/15-21 after hitting .500 (12-for-24) with three doubles, four triples, one home run, four RBI and eight runs scored over seven games. In his second full Major League season, started acareer-high 73 games behind the plate...also set new careermarks in at-bats, runs scored, hits, doubles and RBI...tiedhis career high with eight home runs.Posted a 3.70 catchers ERA, ranking sixth in the National League(Torrealba led the Majors)...Combined with Yorvit Torrealba to tie for the fourth fewest stolenbases allowed by NL teams (79)...fewest stolen bases allowed byPadres catchers since the 2004 club allowed 69...Hit .310 (26-for-84) with RISP and .355 (11-for-31) with RISP andtwo outs...Posted a .292 average (40-for-137) at home compared to a .206 (28-for-136) mark awayfrom PETCO Park...hit safely in 27 of 44 home games with at least one at-bat, posting a.351 on-base percentage and .526 slugging percentage...Batting average reached a season-high .308 (33-for-107) on 6/4, after his 32nd game withan at-bat...hit safely in 20 of his first 32 games with an at-bat. Played in a career-high 78 games, also setting career highs in at-bats, hits, doubles, triples, homeruns, RBI and runs scored...Started a team-high 71 games behind the plate in 2009...Recorded a 4.33 catchers ERA in 643.1 innings behind the plate...seven passed balls...tossed out 10 of 66 attempted basestealers (15.2 %)...Hit on his left wrist 6/9...played in two games following the injury before being placed on the disabled list 6/19 (retroactiveto 6/18) with a left wrist contusion...played in five games for Triple-A Portland as part of a rehab assignment before beingreinstated 8/12...Tallied a career-high four hits 4/12 vs. SF...came a homer shy of the cycle, going 4-for-4 with a double, triple, RBI and arun scored...Belted a walk-off home run in the 16th inning 5/16 vs. CIN...also homered in first at-bat 5/19 vs. SF for homers in consecutiveat-bats...Batted .267 (50-for-187) vs. right-handers and .159 (11-for-69) vs. lefties...Appeared in 21 games in September, hitting .323 (20-for-62) with six doubles, three home runs, 12 RBI and seven runsscored...posted a .386 on-base percentage and .565 slugging percentage. Rookie catcher played in 60 games for San Diego after his contract was purchased from Triple-A Portland 7/3...hit .237 (47-for-198) with seven doubles, one triple, five home runs, 24 RBI, 21 runs scored and 11 walks...Played 59 games at catcher including 55 starts...threw out 14 of 56 base runners attempting to steal, posting a team-best 25.0 caught-stealing percentage...Five sacrifice flies marked the most for a Padres batter after his call-up...16-for-46 (.348) when leading off an inning...Major League debut 7/4 at ARI, collecting first hit, walk and run in the Padres 5-1 win...First Major League home run at PIT 7/26 off Franquelis Osoria...Caught two runners stealing on three occasions: 8/1 vs. SF, 8/8 at COL and 9/19 at WSH...Hit safely in 13 of his last 15 games of the season 9/9-28...closed out the season with a career-high, nine-game hit streak, batting .294 (10-for-34) during that stretch.at Western Oregon University...Began the season at Triple-A Portland, hitting .232 (52-for-224) with 13 doubles, 12 home runs, 39 RBI and 33 runs scored in 58 games...behind the plate in 57 of 58 contests, threw out 23 base runners in 60 stolen base attempts (38.3 percent). Spent the entire year at Double-A San Antonio, his first action at the Double-A level...played in acareer-high 101 games...named the Padres No. 8 prospect by Baseball America entering the season...Caught 94 games for the Texas League Champion Missions...threw out 36.3 percent of would-be base stealers (29 of 80),third best among Texas League backstops...Set career highs in almost every offensive category including doubles (23), home runs (20), RBI (72), runs scored (55) andtotal bases (177)...Finished fourth in the Texas League in home runs and fifth in slugging percentage. Split the season between Single-A Fort Wayne and Lake Elsinore, batting .276 (108-for-391) with32 doubles, 11 home runs and 67 RBI in 104 games...named the Padres No. 9 prospect and best defensivecatcher by Baseball America entering the season...Threw out 48 of 132 (36.4 percent) would-be base stealers between both stops...Hit .406 (28-for-69) with eight homers and 22 RBI during a season-high 18-game hitting streak 5/28-7/1...Named the Midwest League Batter of the Week for 6/12-18...homered in five straight games (6 HR total) 6/10-17. Began his professional career with Short-A Eugene...hit .245 (45-for-184) with nine doubles, onetriple, seven home runs and 27 RBI in 53 games with Eugene and Single-A Fort Wayne...Threw out 20 of 54 would-be base stealers (37.0 percent) with Eugene...Drove in a season-high four runs 7/7 at Spokane to cap a six-game RBI streak (10 total) 7/2-7...Reached base safely via hit or walk in 12 straight games 7/27-8/11...Promoted to Fort Wayne in August and appeared in 10 games with the Wizards to close out the season. March 19, 2019 Oakland Athletics selected the contract of C Nick Hundley from Las Vegas Aviators. February 19, 2019 C Nick Hundley assigned to Las Vegas Aviators. 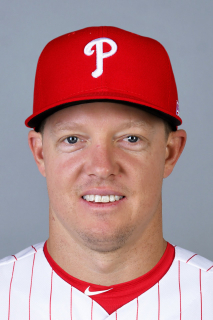 February 11, 2019 Oakland Athletics signed free agent C Nick Hundley to a minor league contract and invited him to spring training. October 29, 2018 C Nick Hundley elected free agency. December 19, 2017 San Francisco Giants signed free agent C Nick Hundley. November 2, 2017 C Nick Hundley elected free agency. January 24, 2017 San Francisco Giants signed free agent C Nick Hundley. November 3, 2016 C Nick Hundley elected free agency. June 3, 2016 Colorado Rockies activated C Nick Hundley from the 15-day disabled list. June 1, 2016 Colorado Rockies sent C Nick Hundley on a rehab assignment to Albuquerque Isotopes. May 6, 2016 Colorado Rockies placed C Nick Hundley on the 15-day disabled list. Strained left oblique. April 25, 2016 Colorado Rockies activated C Nick Hundley from the 7-day disabled list. April 23, 2016 Colorado Rockies sent C Nick Hundley on a rehab assignment to Albuquerque Isotopes. November 6, 2015 Colorado Rockies activated C Nick Hundley from the 60-day disabled list. January 5, 2015 Colorado Rockies signed free agent C Nick Hundley. November 1, 2014 C Nick Hundley elected free agency. May 25, 2014 Baltimore Orioles activated C Nick Hundley. May 24, 2014 Baltimore Orioles traded LHP Troy Patton to San Diego Padres for C Nick Hundley. August 17, 2013 San Diego Padres activated C Nick Hundley from the paternity list. August 15, 2013 San Diego Padres placed C Nick Hundley on the paternity list. November 2, 2012 San Diego Padres activated C Nick Hundley from the 60-day disabled list. August 27, 2012 San Diego Padres transferred C Nick Hundley from the 15-day disabled list to the 60-day disabled list. August 17, 2012 San Diego Padres placed C Nick Hundley on the 15-day disabled list retroactive to August 16, 2012. Right knee contusion. August 9, 2012 San Diego Padres recalled Nick Hundley from Tucson Padres. August 5, 2012 Nick Hundley roster status changed by Tucson Padres. July 18, 2012 Tucson Padres placed C Nick Hundley on the 7-day disabled list. June 30, 2012 San Diego Padres optioned C Nick Hundley to Tucson Padres. August 12, 2011 Nick Hundley roster status changed by San Diego Padres. August 3, 2011 sent C Nick Hundley on a rehab assignment to San Antonio Missions. July 8, 2011 San Diego Padres placed C Nick Hundley on the 15-day disabled list retroactive to July 6, 2011. Strained right elbow. June 8, 2011 San Diego Padres activated C Nick Hundley from the 15-day disabled list. June 4, 2011 sent C Nick Hundley on a rehab assignment to Reno Aces. August 12, 2009 San Diego Padres activated C Nick Hundley from the 15-day disabled list. August 5, 2009 sent C Nick Hundley on a rehab assignment to Portland Beavers.